Background Cognitive deficits are a major determinant of social and occupational dysfunction in schizophrenia. In this study, we determined whether neurocognitive enhancement therapy (NET) in combination with work therapy (WT) would improve performance on neuropsychological tests related to but different from the training tasks. Methods Sixty-five patients with schizophrenia or schizoaffective disorder were randomly assigned to NET plus WT or WT alone. Neurocognitive enhancement therapy included computer-based training on attention, memory, and executive function tasks; an information processing group; and feedback on cognitive performance in the workplace. Work therapy included paid work activity in job placements at the medical center (eg, mail room, grounds, library) with accompanying supports. Neuropsychological testing was performed at intake and 5 months later. Results Prior to enrollment, both groups did poorly on neuropsychological testing. Patients receiving NET + WT showed greater improvements on pretest-posttest variables of executive function, working memory, and affect recognition. As many as 60% in the NET + WT group improved on some measures and were 4 to 5 times more likely to show large effect-size improvements. The number of patients with normal working memory performance increased significantly with NET + WT, from 45% to 77%, compared with a decrease from 56% to 45% for those receiving WT. Conclusions Computer training for cognitive dysfunction in patients with schizophrenia can have benefits that generalize to independent outcome measures. Efficacy may result from a synergy between NET, which encourages mental activity, and WT, which allows a natural context for mental activity to be exercised, generalized, and reinforced. COGNITIVE DEFICITS in schizophrenia limit social and vocational functioning1-5 and persist after treatment with currently available pharmacotherapies. It is therefore important to evaluate new treatment approaches for these debilitating aspects of the illness. In the present study, we evaluated the effects of repetitive practice of progressively more difficult computerized attention and memory tasks in the context of a work therapy (WT) program. Patients were randomly assigned to receive WT alone or neurocognitive enhancement therapy plus WT (NET + WT). In addition to the training of elemental cognitive functions, NET included biweekly feedback on cognitive performance in the workplace and a weekly social information processing group. These treatment elements provided ongoing opportunities to incorporate elemental neurocognitive gains into more complex cognitive operations. In addition, since WT alone is clinically efficacious,17-19 it provided an active control condition against which to compare the effects of NET. To our knowledge, this study is the first to combine methods of cognitive training with WT. Its elements interact to maximize the likelihood that cognitive training will generalize to vocational outcomes. This report focuses exclusively on cognitive outcome data, after 5 months of treatment, for the first 65 patients enrolled. When the study is completed, subsequent reports will describe intergroup comparisons of work performance and vocational outcomes. 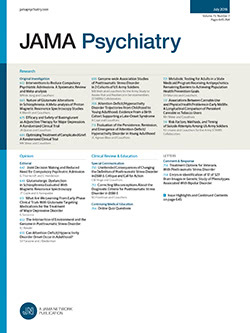 Sixty-five patients with schizophrenia or schizoaffective disorder, as determined by PhD-level psychologists using the Structured Clinical Interview for DSM-IV procedures,20 participated after being referred by their clinicians. All provided informed written consent. Patients were receiving treatment at the Veterans Affairs Medical Center, West Haven, or at the Connecticut Mental Health Center, New Haven. Patients were not considered sufficiently stable to participate if there had been a change in psychiatric medications or housing in the last 30 days, if they had an episode of drug abuse within the past 30 days, or if they had a Global Assessment of Functioning score of 30 or less. Known neurological disease and developmental disability also were causes for exclusion. All patients were receiving antipsychotic medication prior to and throughout the study. Fourteen (22%) were receiving a typical antipsychotic drug only, 45 (69%) were receiving an atypical antipsychotic drug only, and 5 (8%) were receiving both, with comparable proportions and dosages for NET + WT and WT conditions. Neuropsychological testing for pretest-posttest comparisons consisted of (1) Digit Span, Letter Number Sequencing, and Digit Symbol Substitution Task from the Wechsler Adult Intelligence Scale–III21 (WAIS-III); (2) Visual Reproduction I and II, Figural Memory, and Logical Memory I and II from the Wechsler Memory Scale–Revised (WMS-R)22; (3) the Hopkins Verbal Learning Test (HVLT), a measure of verbal learning and temporal lobe dysfunction23; (4) the Continuous Performance Test,24 a measure of sustained attention; (5) Wisconsin Card Sorting Test (WCST),25,26 a measure of perseveration and flexibility of abstract thought; (6) Bell Lysaker Emotion Recognition Task (BLERT),27 a measure of the ability to identify affect cues in videotaped stimuli; (7) Gorham's Proverbs Test,28,29 a measure of thought disorder; (7) Hinting Task,30 a measure of social inference; and (8) Trail-Making Test–B,31 a measure of cognitive flexibility and psychomotor speed. These measures have established reliability and validity and are sensitive to the types of deficits associated with schizophrenia. Work performance was assessed using the Work Behavior Inventory.32,33 The Work Behavior Inventory provides 6 measures of work performance, which include 5 scales (social skills, cooperativeness, work habits, work quality, and personal presentation) and a general score of overall performance. Our studies have found excellent internal consistency, factorial validity, concurrent validity with the Work Personality Profile,34 and interrater reliabilities of 0.89 to 0.93 for scale scores. Cognitive assessment in the workplace was performed using the Cognitive Functional Assessment scale,35 which has 3 subscales: attention/concentration, memory/learning, and executive functions. Interrater reliability intraclass coefficients for our group are in the good to excellent range (r = 0.75 to 0.91). Following informed consent, neuropsychological testing was performed over 2 or 3 sessions and again 5 months after the beginning of the active intervention. Psychologists (PhD or master's level) who were trained specifically in study methods performed all procedures. Following intake testing, patients were stratified based on degree of cognitive impairment and randomly assigned to NET + WT or WT conditions. Significant cognitive impairment was based on 6 key neuropsychological indicators in 4 cognitive domains: (1) attention was represented by the Continuous Performance Test total score wrong; (2) memory was represented by HVLT Trial 1 and WMS-R Figural Memory; (3) executive function was represented by WCST categories correct and Gorham's Proverbs Bizarreness; and (4) affect recognition was represented by BLERT total score correct. A patient must score 1 SD below the mean (established for a Veterans Affairs Medical Center sample of patients with schizophrenia) on at least 2 indicators to be so classified. Twenty-eight patients (43%) met these criteria. Work therapy consisted of (1) payment for work activity at the rate of $3.40 per hour for up to 15 hours per week with increasing bonus pay ($3.90 to $8.40) for 16 to 20 hours; (2) job placement at this medical center; (3) individual counseling when problems arise; (4) a group offering support, problem solving, detailed work performance feedback based on the Work Behavior Inventory, and goal setting; (5) a job coach for job-related difficulties and individual vocational counseling; (6) a certificate of participation in the program; and (7) referral to other vocational services. The most common work sites were in the dietetics department, mail room, grounds, maintenance department, patient transport, and medical administration, with duties similar to those of entry-level employees supervised by regular medical center personnel. Neurocognitive enhancement therapy consisted of (1) feedback from the Cognitive Functional Assessment in the support group, (2) cognitive exercises for up to 5 hours each week for 26 weeks, and (3) a weekly social processing group. Patients were paid for doing cognitive exercises at $3.40 per hour with increasing bonus pay for reaching a maximum of 5 hours of cognitive training. They could also work up to 15 hours in WT for a combined maximum of 20 hours of productive activity per week. Cognitive Functional Assessment feedback was given on a biweekly schedule (at the same time patients receive the Work Behavior Inventory feedback) and consisted of ratings of attention, memory, and executive function from their job. Patients were also encouraged to develop goals based on their Work Behavior Inventory and Cognitive Functional Assessment feedback. Cognitive exercises involved repeated practice on computer-based exercises for attention, memory, and executive function (adapted to our specification by Odie Bracy, PhD, Neuroscience Center, Indianapolis, Ind) and a dichotic listening task. Patients attended 2 to 3 sessions per week. Cognitive exercises used a modified form of Psychological Software Services CogReHab software,38 a multimedia cognitive rehabilitation software designed for use with individuals with compromised brain function. Four tasks were modified from this software package: 2 tasks (Visual Tracking I and Visual Tracking II) for training sustained visual attention and 2 tasks (Sequence Recall: Digits-Visual and Sequence Recall: Words-Visual) for training verbal memory. A fifth task (Pyramids) was used to train executive functions. Task parameters were initially made easy enough for each patient to do well. As soon as the patient was able to achieve 90% accuracy at a given difficulty level, the task was made more difficult following a prearranged hierarchy. Details of the tasks are described below. Visual Tracking I begins with a black line moving across the computer screen against a red background. As this line moves, yellow cubes appear along the line. The patient is required to focus visually at the end of the line and click the left mouse button whenever a yellow cube appears. The patient hears a "TA DA" sound if correct and a wrong chord sound if the patient responds when no yellow cube is present. Data on the percentage of hits and misses are collected. Changing the speed of the black line's movement or the duration of the task increases task difficulty. Visual Tracking II begins with a red circular shape moving about the computer screen in a random pattern against a black background. The patient is required to visually focus at the center of the circle and must press the mouse button when the circle turns yellow. Changing how fast the circle moves around the screen or duration of the task modifies difficulty. Feedback and scoring are the same as for Visual Tracking I.
Sequence Recall: Words-Visual begins with displaying a list of 2 to 10 words on the computer screen for the patient to remember in order. After a delay, one of the words is presented again and the patient must click on a numbered line to indicate its position from the original list. Correct responses produce the "TA DA" sound and incorrect responses produce a wrong chord sound. The number of correct and incorrect trials is totaled. Task difficulty is modified by changing the length of the list, the number of times a list is presented, the amount of time to study the list, and the length of the delay between the presentation of the list and the presentation of the target word. Sequence Recall: Digits-Visual begins with a list of 2 to 10 digits displayed one at a time on the computer screen. The patient must remember the digits in order. After a delay, the patient follows the same procedure described for words. Data collection and procedures for modifying task difficulty are also the same as for the words task. In the Pyramids task, the computer screen displays 3 playing posts with the left post containing 3 to 5 disks stacked in a pyramid. The patient is required to have the disks form a pyramid on the right post by moving the disks, one at a time, from the left post. The program will not allow placement of a larger disk on a smaller one. Data on the number of moves, task duration, and whether the task was solved are collected. Changing the number of disks to move modifies task difficulty. The dichotic listening task requires the patient to listen to a story in the right ear of a headphone set while ignoring poetry heard in the left ear. After listening to a story segment for 30 to 90 seconds, the story and poem are paused and a question regarding the just completed segment is asked. The patient listens to 8 story segments and is scored on the number of correct answers. The distracter (poem) is initially presented at a very low volume and the volume is gradually increased as the patient progresses to harder levels. Eventually the distracter volume is greater than the story volume. The volume of the story remains constant, but the length of the story segments is increased for greater task difficulty. The weekly group for social information processing is similar to a group exercise from the traumatic brain injury program of Ben-Yishay et al.39 One subject each week prepares an oral presentation, with staff assistance, that is delivered to the group. Each group member is required to ask a question and give specific feedback to the presenter. Three topics are given sequentially over the 6 months: "My job," "A day at work," and "What I've learned." This highly structured group experience demands verbal expression, verbal memory, and executive function, as well as social information processing, affect recognition, and interpersonal sensitivity. An intent-to-treat analysis was employed, which used all patients randomized to a condition regardless of degree of participation. From the neuropsychological testing battery, 21 variables were identified that represented the most important cognitive demands of each test. To reduce experiment-wise error, a factor analysis of intake data was used to determine which variables could be grouped by shared variance. These groupings could then be used as dependent measures in multivariate analysis of covariance (MANCOVA). A principal components analysis followed by varimax rotation of intake data revealed that 20 of the 21 variables could be included in a 4-factor solution with eigenvalues greater than 1.5. Failure to maintain set from the WCST was the only variable not included in the 4-factor solution. MANCOVAs were performed on follow-up scores with intake scores as the covariate on each set of variables from the 4-factor solution. Effect-size comparisons were made using χ2 statistics on variables that showed significant differences between groups. Parametric procedures were 2-tailed, and α was set at .05 for all analyses. Finally, a comparison between groups was performed on the number of patients whose scores went from abnormal to normal by using McNemar's Qm, a nonparametric between-groups analysis. McNemar Qm is a conservative test of change because it does not capitalize on the fact that WT showed a slight decline in the percentage of patients whose test scores at follow-up were within the normal range. We defined normal performance using published norms for each instrument. For WCST percent conceptual level responses and percent nonperseverative error, which are standardized scores based on published norms,25 we defined normal as a standardized score of 90 or greater. For the BLERT, we defined normal as a score of 15 (of 21) or better. In a normative sample of 81 college students, all performed within that range compared with 72% of substance abusers and 42% of patients with schizophrenia or schizoaffective disorder.27 We defined normal functioning on the Digit Span Backward task as performing within 2 digits of the subject's Digit Span Forward task performance. This criterion is based on normative tables21 that indicate that most normal subjects will recall digits backward within that range. By basing "normal" on each person's Digit Span Forward performance, we were also taking into account the effect of increased Digit Span Forward performance that might have resulted from the cognitive training. Thus, if a patient could recall 6 digits forward at intake, he/she would need to recall 4 digits or more at intake to be within normal limits. If the patient improved to 7 digits forward at follow-up, he/she would then need to recall 5 digits or more backward to be categorized as having a performance within the normal range. No significant differences were found between NET + WT and WT groups at baseline for illness, treatment, or background characteristics (Table 1). However, MANCOVAs of pretest-posttest neuropsychological variables as they were grouped by factor analysis showed significant differences between conditions. Factor 1 (WCST factor) consisted entirely of WCST variables and MANCOVA indicated a significant difference between groups (F4,55 = 3.97; P<.006). Least square means, which adjust follow-up means by the intake scores, are shown in Table 2. Standardized scores for WCST variables were used so that a higher score represents better performance. Categories correct is not standardized. All findings favored NET + WT. Factor 2 (working memory factor) included BLERT total score, WAIS-III Digit Span Forward, WAIS-III Digit Span Backward, WAIS-III Letter Number Sequencing, WAIS-III Digit Symbol, WAIS-III Digit Symbol Substitution Task, and Trail-Making Test–B total time. With the exception of Digit Span Forward, these variables have in common advanced processing and manipulation of information. This involves accurately absorbing information and retaining it in working memory while taking mental action on it. MANCOVA revealed significant group differences on these variables (F6,47 = 3.07; P<.01), with all findings favoring NET + WT. Factor 3 (thought disorder factor) consisted of WMS-R Logical Memory I, WMS-R Logical Memory II (30-minute delay), Hinting Task, and Gorham's Proverbs Bizarreness score. These variables have in common disorganization of thought and language. MANCOVA did not reach significance (F4,50 = 0.94, P = .45). Factor 4 (visual and verbal recall) consisted of HVLT Trial 1 total score, HVLT Trial 3 total score, WMS-R Visual Recall, WMS-R Visual Recall with 30-minute delay, Continuous Performance Test correct, and WMS-R Figural Memory. This factor consisted of visual and verbal memory tasks that did not require manipulation of information in working memory. MANCOVA showed no group differences (F6,50 = 1.14, P = .35). Having found significant group differences on working memory and affect recognition variables, we compared the conditions on their frequency of patients with large (>0.8 SD), small (>0.2 SD), or no effect-size changes. On the BLERT, 20 NET + WT patients (65%) had small or large effect-size improvements compared with 10 (29%) of WT patients (χ21 = 8.04, P = .005) and 12 (39%) had large effect-size changes compared with 3 (9%) of WT patients (χ22 = 10.18, P = .006). For Digit Span Backward, 21 (68%) of NET + WT patients had small or large effect-size improvements compared with 12 (35%) of WT patients (χ21 = 6.83, P = .009) and 12 (39%) had large effect-size changes compared with 6 (18%) of WT patients (χ22 = 6.98, P = .03). Although these findings indicate that more NET + WT patients improved their affect recognition and working memory, the most stringent test for the clinical significance of an intervention is whether it can return patients to normal levels of function.40 The percentage of NET + WT patients with normal scores on the BLERT increased from 35% to 60%, whereas the percentage of WT patients with normal scores declined from 47% to 42% (Qm1 = 4.03, P<.05). The proportion of NET + WT patients with normal Digit Span Backward performance increased from 45% at intake to 77% at follow-up, whereas the proportion of WT patients with normal performance on this task decreased from 56% to 45% (Qm1 = 6.41, P<.01). For percent conceptual level, 18 (58%) of NET + WT patients had small or large effect-size improvements compared with 11 (32%) of WT patients (χ21 = 4.4, P = .04) and 11 (35%) had large effect-size changes compared with 4 (12%) of WT patients (χ22 = 5.92, P = .05). For nonperseverative error, 16 (52%) of NET + WT patients had small or large effect-size improvements compared with 6 (18%) of WT patients (χ21 = 8.36, P = .004) and 5 (16%) had large effect-size changes compared with 1 (3%) WT patients (χ22 = 8.727, P = .01). The proportion of patients with percent conceptual level responses within the normal range increased from 39% to 48% for NET + WT and from 29% to 42% for WT. The proportion of patients with nonperseverative error within the normal range increased from 45% to 52% for NET + WT patients and decreased slightly, from 47% to 42%, for WT patients. Between-group differences in proportional change were not significant for these 2 tasks. These results support the efficacy of NET + WT and show that cognitive retraining increased neuropsychological functioning to a degree not achievable from the nonspecific cognitive stimulation that comes from work activity alone. These analyses indicate that patients receiving NET + WT showed greater mean differences and more large effect-size changes than did patients receiving WT alone. Moreover, NET + WT demonstrated clinical significance. The number of patients in the NET + WT group with performances within normal limits increased to 60% for a test of affect recognition and increased to 77% on a test of working memory (Digit Span Backward in relation to Digit Span Forward). Compared with WT, NET + WT led to greater improvement in executive functioning as measured by WCST variables. The same was true for tasks that required holding information in working memory and taking action on it. However, the factor consisting of tasks sensitive to conceptual and language disorganization and the factor with verbal and nonverbal secondary memory tasks did not show differential improvement for NET + WT. It is somewhat surprising that cognitive exercises that so heavily relied on computer-based practice of elemental cognitive functioning such as attention and short-term memory should have had greater effect on executive function, manipulation of information in working memory, and affect recognition than on simpler memory tasks. It may be that the social information processing group, dichotic listening, and cognitive feedback from the work site, which were also part of NET and which demand executive function and affect recognition, affected this outcome. It is likely that it is the interaction of all these elements of NET in combination with WT that is responsible for these favorable neuropsychological outcomes. The fact that more than one third of the group receiving NET + WT showed large (>0.8 SD) effect-size improvements on some tests and that a significantly greater proportion of patients achieved normalization of cognitive function on some tasks indicates that treatments such as NET + WT may have clinical as well as statistical significance. There may be a true synergy between NET exercises that encourage mental activity and WT that allows a natural context for increased mental activity to be exercised, generalized, and reinforced. Our next step in this investigation will be to compare groups on clinical, quality of life, and vocational outcomes at 6 months after intake. If we find that NET leads to greater improvement in these outcome domains, we will attempt to associate improvements in neuropsychological pretesting and posttesting as a mediating variable. In so doing we will learn the extent to which improvements in test performance predict functional outcomes. This study did not control for the amount of productive activity patients could engage in except to have a maximum of 20 paid hours of work per week. However, patients in both conditions were productive for about the same number of hours and received about the same amount of pay over the 6-month course of the intervention. Although NET + WT patients may have had somewhat more time for nonspecific interactions with research staff around the NET procedures (which were mostly computer based), WT patients had more time for interactions with coworkers and supervisors, which may have been equivalent in terms of their likely effects on cognitive functioning. This study is also limited by not having a no-treatment control that would have helped us to sort out the likely contribution of WT to cognitive outcomes. We also did not perform imaging studies to determine how NET + WT may have affected brain function or structure, and we do not know how enduring the cognitive improvements might be. In future studies, we hope to redress these weaknesses. Accepted for publication February 26, 2001. This work was funded by a grant from the Rehabilitation Research and Development Service, Department of Veterans Affairs (Dr Bell), and a Career Development Award from the National Institute of Mental Health, Rockville, Md (Dr Wexler). Corresponding author and reprints: Morris Bell, PhD, Psychology Service 116B, 950 Campbell Ave, VA Connecticut Healthcare System, West Haven, CT (e-mail: Bell.Morris_D+@West-Haven.va.gov).